Best Instant Pot Mini 3QT Accessories - Jenuine Home - Interior design, decor, diy for your home and Instant Pot Creations for your tummy. Raise your hand if you just love your new Instant Pot Mini but find yourself scratching your head about which accessories will fit the Instant Pot Mini 3QT? Will your other Instant Pot 6QT & 8QT accessories fit in the 3QT too? 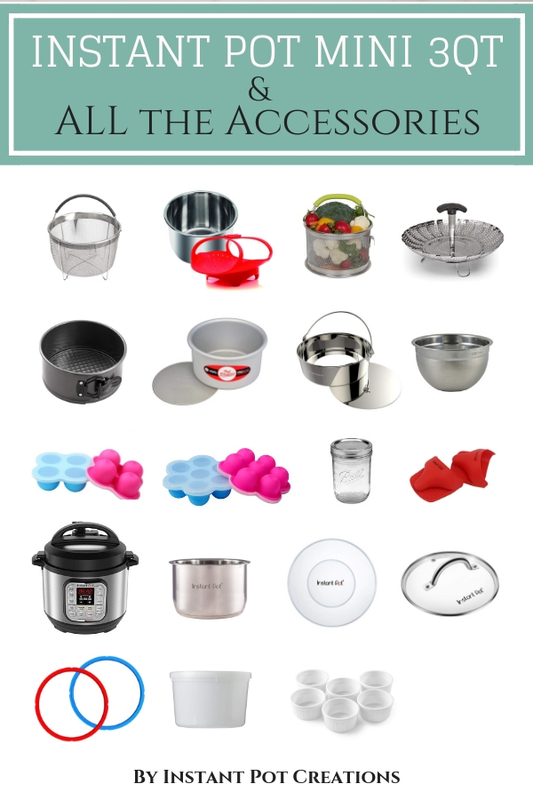 This blog post shares a compilation of ALL of the accessories that I have found after scouring amazon, reading hundreds of comments from online Instant Pot users, in addition to my own findings. When I purchased my first Instant Pot, I bought the #1 best selling model, the Instant Pot DUO 6QT, just like everyone else. 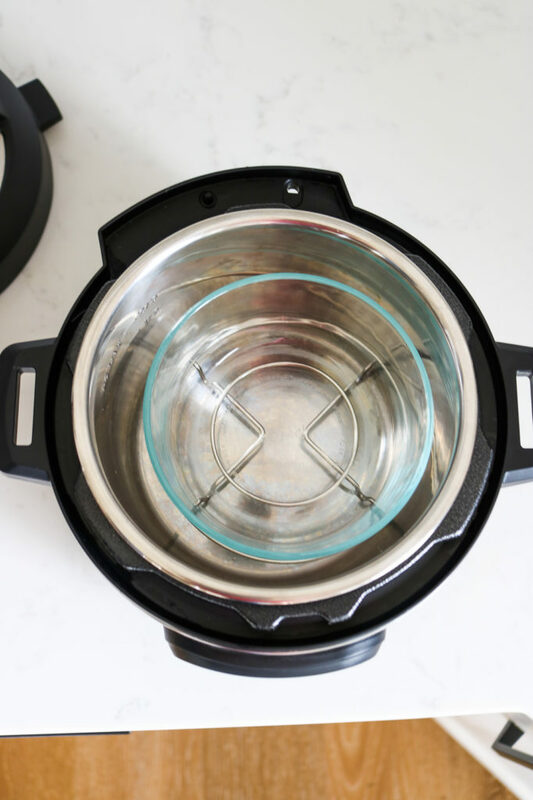 Within a week of cooking with it, I quickly realized that I needed a second Instant Pot so I could be even more hands-free in the kitchen! That way I could cook chicken in one and steam veggies in the other. 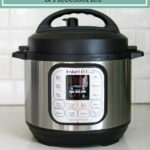 For my second Instant Pot, I ended up purchasing the Instant Pot DUO 8QT so I could have something large enough to do a big pot of soup AND have leftovers the next day. I love being efficient, with less cooking and dishes whenever possible. Then I saw the Instant Pot Mini 3QT make its debut in the market and I thought it was super cute but that I didn’t really have any need for it at all. Oh boy, was I wrong. I decided to purchase my Mini IP last year on Black Friday so I could complete my Instant Pot family. Right away, I did the water test on it to make sure the unit was working properly. Then I made our favorite jasmine rice in it! Rinse the rice in a strainer/steamer basket. Add equal portions rice to water ratio. We can easily make 3 cups of rice to 3 cups of water fit (the max amount that will fit) in the Instant Pot 3QT. Stir rice and water in the pot. Pressure cook on High for 3 minutes followed by a natural pressure release for 10 minutes. Quick release any remaining pressure. Open lid, fluff with serving utensil and serve! My first hiccup was that the buttons on the Instant Pot Mini 3QT DUO are slightly different that the 6QT & 8QT DUO. 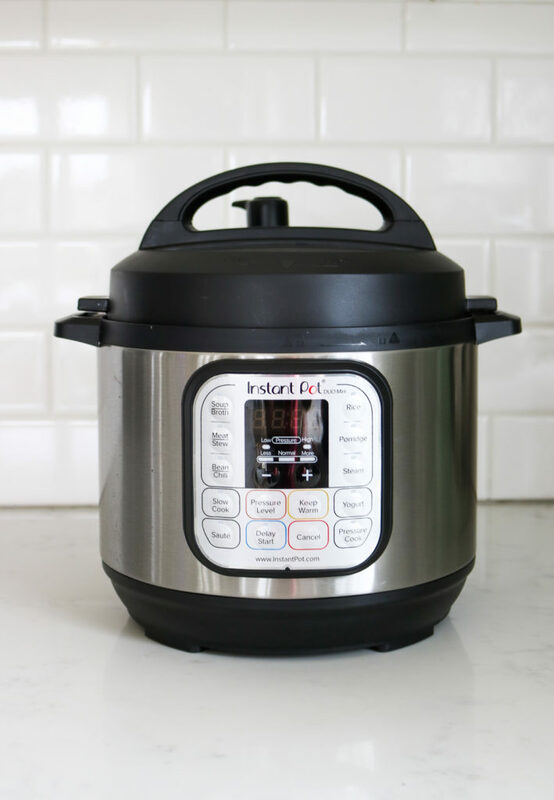 Instead of a MANUAL button to push for pressure cooking as it appears on the 6QT & 8QT DUO models, the button is called PRESSURE COOK and it’s located in a different spot on the front panel on the Instant Pot Mini 3QT. Ok, that’s not too hard to relearn a more specified name and new location, but it still always takes me a few seconds to find it. Haha! I also noticed that it came to pressure a few minutes quicker than the larger models. Yay! 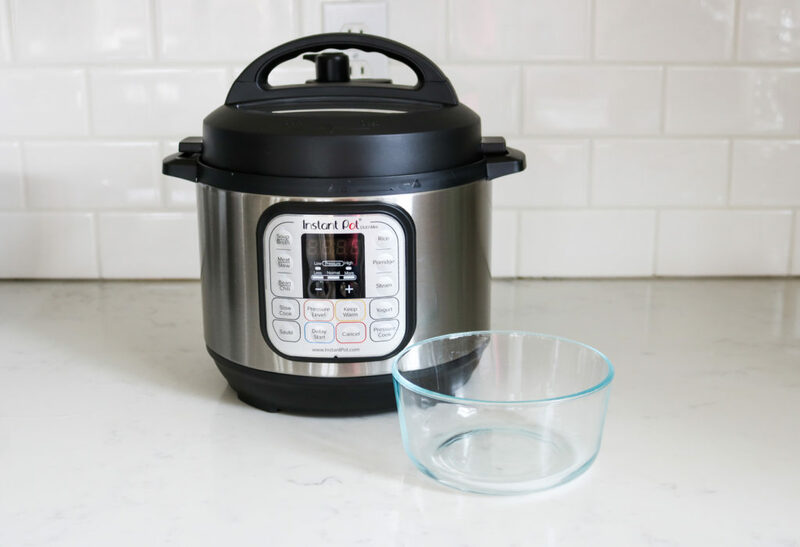 This is to be expected since the Instant Pot Mini 3QT is a much smaller capacity and takes less time for the water to convert to steam for enough pressure to cook. My FAVORITE thing about the Instant Pot Mini, is how FAST it releases pressure after cook time is over when you perform a quick pressure release! I couldn’t believe how fast it came down from pressure, taking only 15 seconds! Amazing, right?! The larger 6QT & 8QT models take about 5-10 minutes (or longer if full of hot soup) to complete a quick pressure release. Baking the perfect egg bites (think sous vide Starbuck’s kind) with this mold and recipe from my Instant Pot Ebook. Thawing frozen raw ground beef. (Cook on high for 30 min with 10 min natural pressure release right on the trivet with 1 cup of water). Reheating leftovers in an oven safe bowl on a trivet with 1 cup of water in the bottom of pot for 2-5 min on STEAM mode. Dormitory/College in room cooking for healthy meal options when there’s no kitchen/stove available giving you both SAUTE or PRESSURE COOK mode. Perfect size for RV travel or taking with you on a plane (as a carry on) for cooking when away from home. Remember that the same rules apply with the 3QT as the larger models. The Instant Pot always needs to have liquid in the pot to build up pressure from the liquid turning to steam. 1 cup is the minimum needed for the 3QT and 1 1/2 cups for the larger models. Do not fill the pot more than 1/2 way full for items that double in size (such as pasta, rice, beans), and 2/3 full for everything else (such as soups). The max amount of rice to cook is 3 cups rice to 3 cups liquid to fall in the pot capacity filling guideline. Check out my amazon store front where all of these Instant Pot Mini 3QT accessories are listed all in one place. I will continue to keep adding to the list as the availability and new products come into market that will work for the Mini. This stainless mesh steamer basket with silicone handle also doubles as a strainer. I use this type of basket the most! Here’s another stainless steamer basket that is similar. Silicone Steamer Basket that can fits the 6QT but can also squish inside the 3QT. Or this silicone steamer basket (below) that folds into itself also works. If you like stainless steel, then you’ll love this steamer basket with a handle. This springform cheesecake pan fits perfectly. Some favor this push pan cheesecake pan. I prefer using stainless steel whenever possible with cooking. These egg bite molds are like the ones that fit the 6QT & 8QT models, but these are smaller to fit inside the 3QT. This also means that instead of holding the regular 2.3oz, these only hold 1.2oz in each cup cavity. If you prefer the larger egg bite molds, this set will give you the 2.3oz per cup capacity but has fewer cup cavities so that it fits inside the 3QT. If a recipe calls for cooking something pot in pot, or cooking in a separate bowl inside the Instant Pot, then this oven safe pyrex bowl is what I recommend. This stainless steel bowl also fits inside the 3QT for cooking pot in pot. 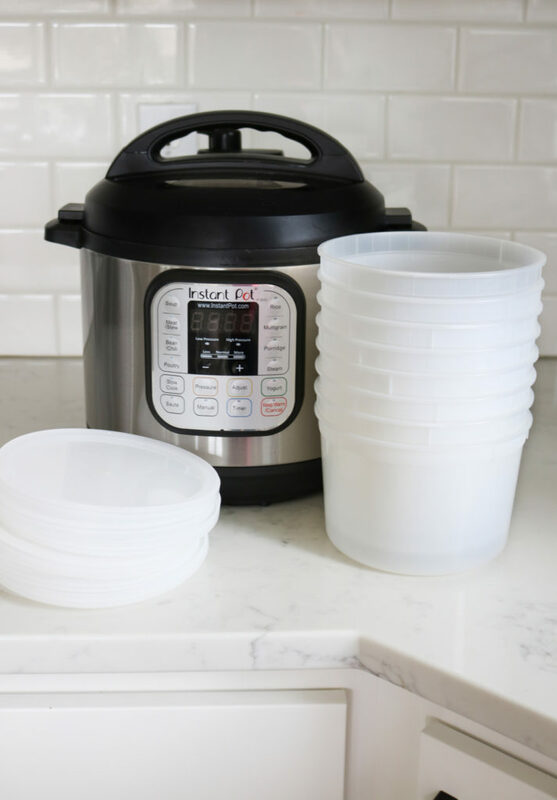 This Instant Pot silicone lid comes in handy when you want to store leftovers in the fridge right in the pot! Or use for yogurt during the refrigeration period. 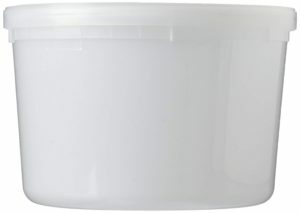 This glass lid is great for using during slow cooking mode, yogurt incubation or making popcorn. You can also use any stainless lid from one of your other regular cooking pots that you have at home that fits. I always recommend having an extra silicone ring for when you want to cook something sweet vs savory. That way your oatmeal won’t taste like garlic. It is also recommended to switch to new sealing rings every 6-12 months. Sometimes you need an extra inner pot because the other one is busy with leftovers or still sitting in the sink, waiting to be washed. It’s ok, no judgement here. I hate dishes too. Ever wanted to make those amazing lava cakes, flan or creme brulee? You’ll need these cute ramekins. Seen those cute breakfast in a jar recipes? Then better grab some mason jars to make some of your own! Did you know that you can freeze your meals raw inside a ziploc gallon bag in a round container? Freeze in the round bucket and once frozen, remove the frozen ziploc food from the bucket and keep food in freezer until ready to cook. Then it’s ready to pressure cook and the round shape will perfectly fit inside the 3QT Instant Pot Mini! I love using silicone mitts to help me lift out hot things out of the instant pot or when transferring the hot inner pot by itself. For the majority of the time, you’ll find me using the Instant Pot Mini cooking jasmine rice or quinoa. My favorite way to use the Mini is cooking chicken breasts, thighs or tenders when I need some chicken cooked for a recipe that I am making on the stove top or will be baking. Recipes such as enchiladas or chicken fried rice always need precooked chicken and the Instant Pot Mini cooks the chicken the most tender out of all of the Instant Pot models I have. Plus, the natural pressure release is much quicker since it’s so small. This makes all of those meals calling for precooked chicken SO much easier to make. Hooray for meal times made easier! 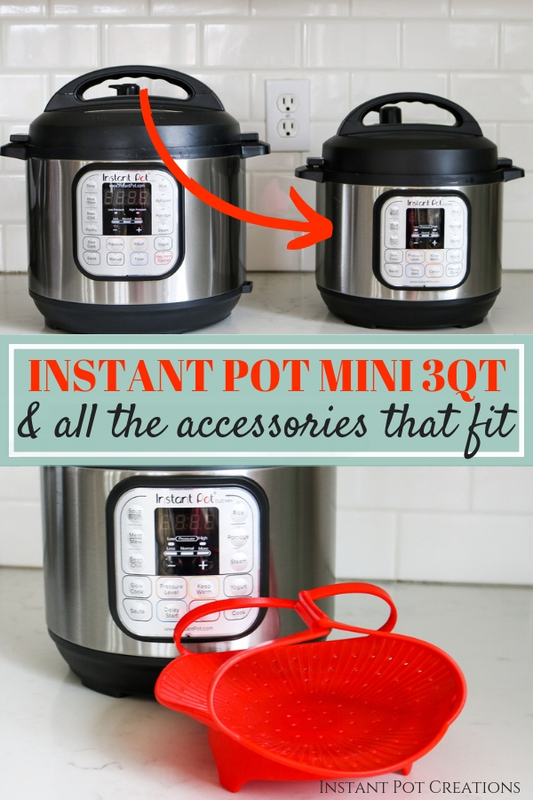 Hopefully this post answered all of your Instant Pot Mini 3QT accessories needs! Don’t forget to Pin it for later! THANK YOU FOR VISITING MY NEW WEBSITE REFRESH TODAY! 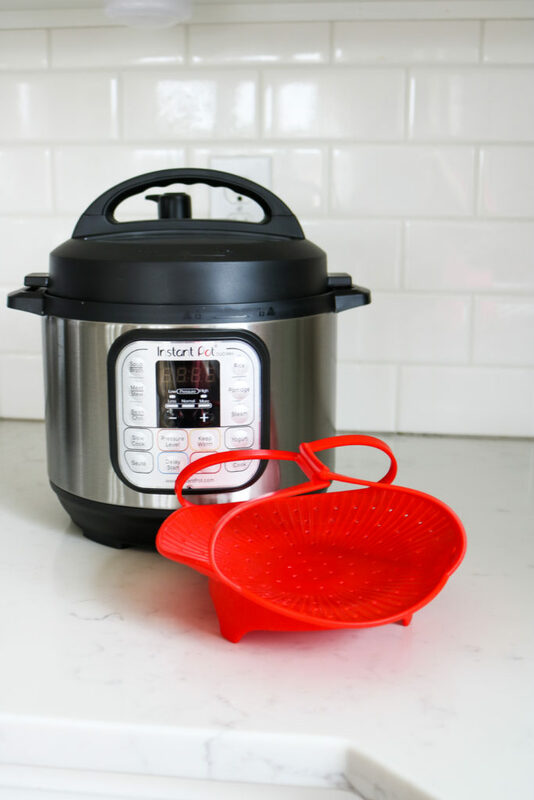 As a thank you for being such awesome readers and coming to check out my new website, I’m doing a GIVEAWAY for one of you to win an Instant Pot Mini 3QT DUO and any 2 accessories of your choice! To enter the giveaway, leave a comment telling me which 2 accessories you would love to have from the ones shared in this post! Hurry, the giveaway ends Tuesday, April 16th at 11:59PM PST. Winner will be notified via email. Would love an extra pot and the glass lid as accessories! Great choices Kathryn! An extra pot and lid are so good to have! I had no idea there was a 3 quart pot! It would be super convenient for smaller portions like you mentioned or when boiling eggs. There are so many accessories available also. My favorites are the stainless steel bowl and glass lid. Right?! Isn’t the Mini so cute?! It definitely comes in handy for those sides and having a second pot for cooking! I have wanted to get a 3QT to accompany my 8QT for sides, and having a mesh steamer basket and crockpot lid would make it so handy!! Eissa YES! If I could go back in time and could only pick two Instant Pots knowing what I know now, I would have an 8QT for larger batches of food/soup, and the 3QT for when I need something smaller or a second pot to cook in! Great choices on the accessories too! I would love to win the Mesh Steamer Basket and Instant Pot Glass Lid!! I’m SO glad you found this post helpful Quyen! And great choices on the accessories. I use my mesh steamer basket A LOT! The egg bite molds and silicone lid would be an awesome addition to my collection. Quick and easy breakfasts with the egg bite molds, and not having to cover my IP in the fridge without foil would be great! I’m excited for the new site! Kaari, quick and easy breakfasts are my jam too. And hooray for lids instead of having to use foil! Great choices! Thank you for commenting and checking out the new site too! Crazy right?! So many fun ones to choose from! Thank you so much for coming to check out the new site too! Thanks Anne! Those are great accessories that are also what I think are necessities too! The mesh steamer basket and extra silicone rings are on my wish list. Hi April! Thank you for coming and checking out the new site! I really wanted it to be so much easier and user friendly for everyone to use! Those accessories are great choices too! I would love the mesh steamer basket, and an extra pot! Rice would be so much easier in the 3 qt! Rice is so easy in the 3QT for sure! And I LOVE the mesh steamer basket, good choices! I really like the flow of the new website. Much easier to read and navigate. I’d really like to be considered for the Silicon Steamer Basket and Silicon Egg molds. Thanks! Thank you Manuel! I’m so glad you are enjoying the new website. I really wanted to make it SO much easier to navigate and use for everyone. Yay! Great choices on the accessories! Glass lid and mesh steamer basket! Thank you Whitney! Those are great choices! 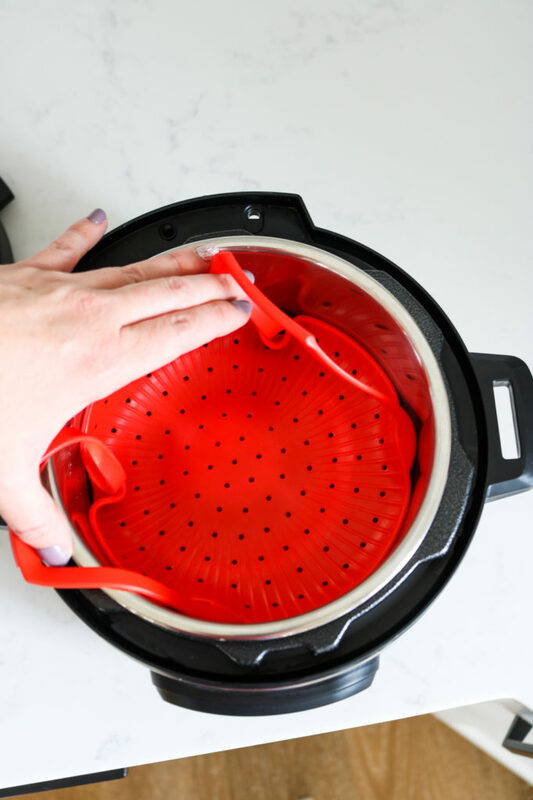 I LOVE using a steamer basket with my Instant Pot. Love the new site! The two accessories I’d like to have most with a 3 Qt IP would be the Pyrex glass bowl and the silicone sling for pot in pot cooking. Thanks for the chance to enter! I would love the stainless steel basket and the egg bite mold! Thanks! Hi Tricia! I LOVE having a good basket for steaming! And those egg bite molds are so fun! Great choices! The steamer basket and the egg bite molds would be so useful!! You will love those two accessories! Thanks for commenting Marta! I need to get the silicone steamer basket and egg bite molds. They would be so handy!! Those accessories are definitely so helpful for cooking with the Mini! Thanks for commenting Sherilan! I would love the mini with the cheesecake pan and the egg bites mold. The mini would come in handy to make the whole meal via IP. I freaking love that thing. Excellent choices in the accessories! I love having more than one IP to do exactly that, to make a whole meal via IP! Handsfree cooking, yes please! f a n t a s t i c ! I love everything I saw as I scrolled through and I’m sure all your followers appreciate you as much as I do! The many recipes I have tried have ALL been a win at my dinner table. p.s. hopefully you aren’t receiving this message in triplicate as I tried many times to send but it kept coming back as more fields need to be entered. If so, triple good wishes to you! Oh my goodness, Traci! Thank you SO MUCH for leaving such a kind comment! It really means so much! I’m so glad you like the look of the new website and I’m so excited that I can finally share it with everyone! And thank you for trying out my recipes too! I love hearing that, it’s why I keep on sharing. I never realized all the things you could make in the 3qt cooker! I’d love to add one to my 6qt. I think the steamer basket would be great as well as the buckets to freeze your food in the ziplock bags. Yes, it’s a surprising helpful little thing! I even surprised myself at how much I love it and use it! Those accessories choices are smart ones too! A steamer basket and the springform pan!! A steamer basket is definitely a must have! And those springform pans make such good cheesecakes! Thanks for commenting Melissa! Thanks Nicole! Those are perfect necessary accessories for any Instant Pot! I love your page and all the helpful tips and recipes! It’s so nice to have access simple, healthy, and tasty recipes for a whole family. I have learned so much about cooking with the Instant Pot 6 Qt. since following your Instagram page. I would love to be able to add the Instant Pot Mini to be able to cook sides or desserts while cooking entrees or bigger portions in my 6 Qt. Thanks for all you do! Hello Ashley! Thank you SO much for taking the time and writing such a thoughtful comment. It really means so much. I agree, having another Instant Pot makes cooking even easier because it makes more handsfree cooking in the kitchen! The Mini would definitely work great alongside the 6qt! Forgot to mention that I would love to have the stainless steel inner pot and the silicon lid! Thanks again! Happy for your new site!! I would love to win a steamer basket or stainless bowl!! Thank you so much Tonja! The steamer basket is always a good choice! Stainless steel bowls are always a classic kitchen item too! I would love the extra rings, steamer basket and egg bite molds! Thanks for commenting Tawna! Those accessories are great choices. The egg bite molds are just so fun looking, aren’t they? Love all the accessory suggestions. The silicon steamer and trivet would be my top! Hi Mary! Thank you for being here and leaving a comment! A good steamer are always a must have for cooking with the Instant Pot. The trivet comes with the IP in the box, so if you won, you get to choose another accessory to go along with it. Love this giveaway! I would love the steamer & glass lid! I’m happy you’re excited about the giveaway Chiami! Thank you for being here! Those accessories are great choices! Haha! Your comment totally made me smile and giggle Heidi! I hope you actually have to make the decision too! Thanks for coming over and checking out the new site. Hugs! Hi Jill! Unfortunately, there isn’t a separate silicone sling just yet that fits inside the Instant Pot Mini (although they do have ones for the bigger sizes). The stainless steel cheesecake pan comes with it’s own handles though, so you wouldn’t need to have a sling for that one. Hooray! I didn’t even know there was a mini version, and who knew there were so many accessories! Thanks for inspiring me in my kitchen, Jen! Oh Crissy! Thank YOU for coming over and commenting. The mini version is just so stinking cute, I love it. I’d love an extra pot & the plastic bowls for freezing in. I tried to batch cook the other day and it was a mess with 1 liner in each of my IPs. The steamer basket & egg molds are cool too! Thank you for this post. Oh yes, those plastic bowls will definitely come in handy for your batch prep days for sure! Thanks for commenting Alys! Thank you so much for sharing these great accessories. Ooh, yes! The steamer basket is great for bone broth making! And I’m with ya on not wanting to dirty another dish for leftovers if you can just put a lid on it and put it in the fridge! All of these accessories listed are for the mini. Do you have a preference when it comes to steamer baskets? My kiddos love steamed veggies so would love to get a steamer basket and also a springform cheesecake pan. Hi Sadie! So glad you hopped on to check out the new site! I LOVE using the mesh steamer basket because I use it for so many other things besides steaming. I fill it up with eggs and cook an entire basketful of hardboiled eggs at the same time or use it to rinse rice or dried beans before cooking. Great site!! I love all of your stuff. I would love The ramekins and the mesh steamer basket. Thank you Jessica! I’m so glad you came over to check out the new site! Aren’t the ramekins so cute? Great choice in the steamer basket too! I love those little silicone mitts! Too cute💕. Best of luck with your new website! Thank YOU so much Wendy, for coming and checking out the new site! I wanted to make it more user friendly for you all! The silicone mitts definitely come in handy whenever I cook pot in pot meals! I would definitely find it useful to use the mesh steamer basket and silicone lid with the Mini 3qt. Would make a great addition to my 6qt IP! Those are great choices, thanks for commenting Alina! I would love a IP 3 qt mini with a push pan and silicone steamer basket. I can think of so many recipes for these two accessories. Thanks for this great giveaway!!!! and all your hard work!!!! Terri! Thank you for coming over and checking out my website! Ooh, I’d love to see all of the fun recipes you would make with those accessories too! Love how you break down all the accessories…I had no idea all of these existed! Can’t wait to try them. Thank you Sara! I’m so glad you liked that! There is so much confusion for those who own the Mini, on which accessories work/fit and I knew that a comprehensive listed was needed! Hehe! I’m so glad I’ve enabled you further in the Instant Pot realm. 🙂 The mini really is so stinking cute but I do love it more than I thought I would. If I could go back in time and could only buy two instant pots, I would buy the 8qt (for larger soup batches) and the 3qt mini for when I need to cook in a second pot. Hey! I love your instagram and haven’t checked out your website until now — love it! So many great tips and recipes. If I had to choose two accessories it would be the steamer basket and ramekins! The inner rings and an extra pot! Definitely need to try the springform cheesecake pan (have you done any dairy free cheesecakes?!) and I think the silicone lid would useful, esp if they make one for the 3qt. 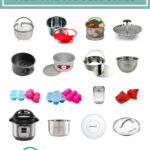 I’d love to get the silicone steamer basket and the stainless steel bowl! Love the new look! Mesh steamer basket and glass lid. Beautiful website. I would love to win a 3qt instant pot with the metal mesh steamer basket and the silicone oven mits. Thanks. I would love to win the 3 quart Instant pot and give her a try! I’ve been really wanting to get a steamer basket and the silicone mitts look nice too! Like the website, and instagram page. I’m working on saving up to buy my first instant pot (college tuition is surely taking most of my savings haha…) but I’d absolutely love the springform cheesecake pan and the instant pot silicone lid! One day, I’ll have enough saved. 🙂 Thanks for the blog post! I’d love to get the stainless steel cheesecake pan and the smaller egg bite molds! This seems perfect! I’ve always wanted an extra instant pot for side dishes – and this mini is perfect! I love the steamer basket and the stainless steel bowl (to use like a double boiler)! Love this post! I have yet to get any accessories for my 6qt! I am seeing a lot of good reviews on the steamer baskets with silicone handles and push pan cheesecake pans! Would love them to start my IP accessories collection! I would love to win this!!! I would like the steamer basket and the silicone lid! What an awesome giveaway! I’d love to win the lid so I can what see what’s inside when I’m sautéing and I can bring the whole pot to the table! I’d also love to win the rings so I can make plenty of desserts which won’t smell savory! Fingers crossed! I’d love to win this! Love the website and blog. Can you just come over and do a tutorial at the house?!? I love my instant pot and keep learning new things with it. Your ebook is so nice because of the dietary restrictions, not many recipes have all the gluten and dairy free options. To choose only two favorite mini accessories would be challenging. There are too many I’d like. The ramekins or spring pan would be great or the silicon egg bites and freezer bowls augh…too many choices. I need the stainless steamer basket and the Pyrex bowl 🙌🏻💗 such good tips!! And the silicone egg bite molds!!?! So much easier than using silicone cupcake liners! I love my Instant Pot so much! I use it every day, sometimes 2-3 times a day. My favorite accessory that I would love to win would be the ramekins because I LOVE CREME BRÛLÉE and I would absolutely use those for desserts all the time! My second choice would be extra inner pot rings – you can never have too many! I love using different ones for different types of meals and flavors! You’ve sold me on the mini! I’d love to get one to complete my IP family. I am very interested in the silicone steamers! I’ve always wanted to try one of those! I would love to get the silicone steamer basket and the metal pan. I can’t wait to get a 3 qt!! I think I’d get extra rings so I can make sweet and savory recipes. I’d also get a steamer basket for my eggs!!! I don’t own an instant pot! I purchased one and returned it because it was so big and I prefer traditional cooking. However, this mini would be a great fit! I live the stainless mesh steamer basket and the silicone basket! I have been searching for a good deal on the 3qt duo! I’d probably want the glass lid to use while making yogurt, or a steamer basket. But they are all so good, how do I really choose? Thanks for sharing your knowledge! Egg molds and a glass lid! 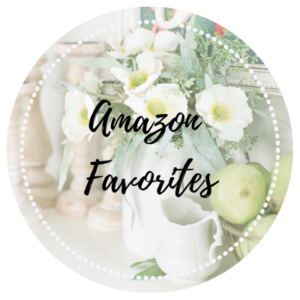 So many great items, I have the larger Instant pot, but the mini is on my wish list. Thank you for the great information. Love our 6qt but a 3qt would be amazing for sides and rice! Definitely interested in the stainless steel bowl that fits inside for PIP and the silicone steamer basket! Thank you!!! I would like the freezer buckets. I need to make some freezer meal for when My son comes home from college this month. I also want to make some dessert and need the ramekins. I’ve realized how nice the silicone IP lid is for leftovers! I’m also a fan of poached eggs in ramekins. Getting hungry just thinking about brunch! Great post! My 2 favourite accessories would be the cheesecake pan and glass lid. Love your recipes! I would love a 3 qt, I would love to be able to use the steamer basket in it and the glass lid for yogurt! Stainless Steel Bowl & Basket- both have the potential for so many awesome uses!! Silicone Mitts and steamer basket!! Who can go wrong with a cheesecake pan and silicone steamer basket. Hello I am new to your site but it is just beautiful. I would love to try the 3 quart and definitely need to add to my instant pot family. I would love to try the steamer basket and probably the lid to try my hadn’t at yogurt. I would love to have the springform cheesecake pan and the extra inner vessel. Some days I’m just to lazy to keep washing my inner vessel and I use my mini a lot for our daily cooking. I’d love a lid and a steamer basket for my instant pot! I would love the cheesecake pan and the circle storage containers! YOU WON!!! Congrats Becky! I’ll contact you via email for your mailing address! I’m so excited for you!! I would love to win a set of extra seals and a stainless steamer basket. What a great post, we were gifted the larger instapot for our wedding but with just the two of us we find it really big and it takes a long time to come to pressure. I really am thinking of a smaller unit now, thanks. I would love to have a glass lid for the top and one of those Oven safe bowls to make some new recipes. Love all the information! It’s super helpful to know which accessories allow you to do what, and having extra silicone rings is such a great idea! My sister has one that permanently smells like spices so I was hesitant to try anything sweet with it (when I finally get an Instantpot that is…), but now I don’t have to worry about that. The stainless steal steamer basket also looks like a must have for putting tons of veggies in to steam. Thank you for such an awesome giveyaway! I would pick the ramekins because my girlfriend loves crème brulee and the extra silicone rings so that flavors don’t get mixed up since we use our instant pot all. the. time. Thank you for the great post with all the fun accessories. I’ve always wanted to try a pot in pot recipe to make cheesecake, chocolate molten cake in the ramekins or fried rice in the stainless steel pot. Articles like this help me to know what is safe for my Instant Pot. Thank you. I would use a silicone steamer basket and the springform cheesecake pan the most!! Great site! Love the ramekins and springform cheesecake pan! I love all your accessories you have for your instant pot! I have an egg bite mold now and I use it ALL the time. I’d love to have the steamer basket and the cheesecake pan! How crazy is it that you can make a cheesecake in your instant pot?! I’m always amazed by the cool things it can make! The 2 accessories would be Stainless Mesh Steamer and Silicone Mits. I would love the silicon steamer basket and ramekins. They both seem to be able to be used for so many dishes! 3 qt looks so handy! I would enjoy the springform cheesecake pan and and the cheesecake push pan. Cause who wouldn’t want a mini cheesecake? Love your blog! The color scheme is beautiful. Everything is presented well, its clean and pleasing to the eye. I have a 6 qt…would loveeee to get a 3 qt. The 2 accessories I would love to have would be the extra silicon rings and the glass lid. I often switch between making sweet and savory in my instant pot. The smell sticks to the silicon rings from the savory! An extra ring would solve that problem!! The glass lid would help when I am trying to boil something or when slow cooking. I have the 8 qt duo to use when our family is here. Would use the 3 qt for the two of us. A steamer basket & sling would be great to have! Hi thank you for all this information, I would like to enter t the giveaway. The two items I would like to have are the silicon rings and the stainless steamer . . So good information, thank you for that. I would like to enter the giveaway and my two items that I would like to have are the stainless steamer and the silicon rings. I didn’t realize all the convenient uses for a second/smaller version of the IP!! I like the options it gives me to make vegetables on the side and other side dishes that add to a one-pot meal!! It’s just me and my 24 year old and I still have “mom guilt” if I don’t have a full meal prepared. This is in my own mind….he’s willing and capable of making his own food. I think the mini IP will open him up to more of his own cooking as well!! I would love to try the egg bite molds and cheesecake pan, as breakfast and dessert are two things I’ve never made in my IP!! I look forward to trying though!! I’ve always wanted a tiny one for sides! And I think the egg holder and steamer basket would get used the most at our house. love your website and recipes! i’d love to try the steamer basket and cheescake pan. I would love to win the mesh steamer basket and egg bite molds!! I would love to have the mini to complement my 8qt… which I use all the time and love. I would love the extra inner pot and the glass lid. Hope I commented on the right thing for the giveaway. I’d love to have the ramekins and the silicone lid for the instant pot! I would love a springform pan to make cheesecake small enough for me to enjoy! Also the egg molds – there’s so many possibilities with them! For the instant pot I would love having a strainer/steamer accessory as well as a spring form cheese cake pan! Hi Jennie, I have recently discovered the IP and absolutely love it. You are doing a great job with the website. Had no idea there are so many accessories available till I read this article. I would love to have an extra instant pot and an IP silicone lid! Would love the ramekins and another inner pot! I’d love the stainless mesh steamer and the fat daddios cheesecake pan! Love your website by the way! Seriously adorable! I need the cheesecake pan and the egg bite molds! I hate baking egg muffins in the oven. my 2 accessories would be the egg cups and cake pan. I love my 3 qt mini far more than I ever imagined. I find myself using it more than my 6 qt duo. It’s amazing how much it holds. I would love the stainless push pan with handle and the stainless steel bowl. They would really add to my potting. Love the spring form cheesecake pan and the egg bite molds! I currently own a 6qt and I’m thinking I need the 3qt now! Extra bowland Pyrex bowl please 🙂 I want to try making 2 things at once! I love my 6 & 8 quart Instant Pots. I often have them both going at the same time and sometimes twice a day. We’ll be purchasing a motorhome soon and I see a Instant Pot mini in my future. After reading your article I’m lookin g forward using a mini. It will be perfect for me & my husband. My 8 quart IP will need a new home though. I do have a question though. How often do you replace your silicone seal? How do you get the smell out of the silicone rings? Thank you for sharing you cooking wisdom with us. Definitely the steamer basket & glass lid! My two accessories would be the mesh steamer basket and the extra pot. I’d love the mesh steamer basket and the extra silicone rings! Both would be so useful! Extra pot and Pyrex bowl please! Gosh, I hadn’t thought about the possibilities of the mini! I would definitely love to win the steam basket for veggies and the glass lid to make popcorn! Thanks for this! Love using my IP and I’m addicted! I’ve been wanting to get a silicone lid and mesh steamer basket! the freezer buckets are brilliant!! 🤯Wow! Plus I need those silicone mitts. It’s torture trying to get the liner out! I would love the springing form cheesecake pan and the silicone steamer basket. I would be able to use both for so much stuff! Awesome post, my friend! (Look at all those COMMENTS!) So happy you have your new site going… looks amazing! The glass lid and egg bite molds. I love my instant pot and I am excited to look over your new website. Hi. We need a 3qt mini IP so we can make a side dish in while cooking the main dish in our 6qt IP. My husband started a new job so money is Super tight right now, so there is no money in the budget to purchase one any time soon. Love the website!!! Very user friendly. Happy Easter & God Bless!!!! I traveled here from Instagram and just wanted to say I love all your posts! I don’t know how I ever fed my family before we got our instant pot, hah! If I had to choose two accessories, I think I would choose an extra inner pot and the egg bite molds. Glad I found your website! Would love to explore with more instant pot recipes. Would love to get the extra pot and the extra rings. Your website is so beautiful and I’m so excited to learn even more about instant pot cooking! I think you’ve talked me into a smaller 3QT one after this post. I’ve been using my 8QT for everything for two years and would love to get another instant pot. I think the glass lid and steamer basket would be the most handy for me! Thanks for an amazing contest. I would love the ramekins and egg bite molds! I have been eyeing the stainless steel steamer basket for a while now!!! I would love to have it for bone broth, rinsing my rice and many other things. The 3QT is adorable and so handy! The lid and the steamer basket are great accessories to have. I have a 6QT and I get annoyed when I have to cook rice on the stove because the IP is in use! Haha! I thought your tips on steam reheating and freezing in a bucket are genius! Going to apply that to mine. Thank you for taking the time to write this helpful post! Holy cow! I had no idea there were so many amazing accessories! I’m kind of new to the instant pot world and learning so much just in the few days I’ve known about you! I think my best “firsts” would be another ring, as well as one of the steamer baskets – we do veggies with every meal and that would make it so much easier!!! 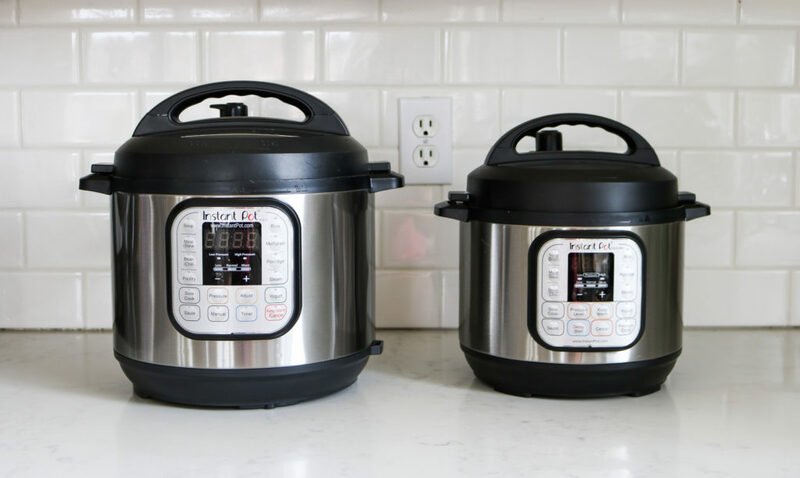 This is so helpful as I have always been puzzled in how to use the smaller size Instant Pot! The extra rings are always helpful, and egg bites look so delicious. My IP has been so helpful as I am a new celiac, and long time diabetic. Thank you for your recipes and dietary exploration! I’ve been wanting the mini ! I’d choose the silicone lid and the extra inner pot. So excited about your website, it looks great! Thank you for such an informative post! Been wanting an instapot for years and didn’t know they sold these many accessories you can use with it! Definitely need the silicone steamer basket and cute little egg molds if I win! I love ….your love… for the 3qt and that makes me want to get it. I am eyeing the silicon basket and those egg bite molds (need to try those). I would love the stainless steel pan and the silicon mittens to keep trying new recipes, I have learn so much with your trick and recipes thanks so much! !